Home / Campus & Local / Opinion / Other News / Politics / Social Media / State / U.S. / Opinion: Should the Confederate monuments come down? In Charlottesville on August 12, 2017, white nationalists defended the Robert E. Lee statue from being torn down or removed. There were people that were injured as well as one that was killed. This is what sparked the call for the removal of Confederate monuments. 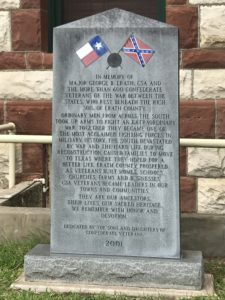 Just like other monuments, Stephenville’s monument could also be in hot water. According to an article by the New York Times in August of last year, over 30 monuments and public plaques have been removed in multiple cities across the U.S. Over 15 monuments in different cities have also been proposed for removal. In short answer: Stephenville should be. The monuments should be taken down in Stephenville. There is a time and a place for everything and the time for these Confederate monuments are over. The historical value of the Confederate monuments is important to knowing a part of our country’s history. In school, teachers and professors have etched America’s history into many students’ minds about the history of America, so all students know it well. There is good and bad that comes with the American history, but why continue to celebrate the bad? According to an article by Kevin Drum, “The Real Story Behind All Those Confederate Statues, “the erection of Confederate statues and monuments in large numbers” came during the years 1895-1915. The Civil War was 1861-1865. If the Confederate monuments were to honor the Confederate vets, why were they put up 30 years later and not right after the Civil War? That sends another message: The Confederate monuments may have been put up to scare and entice black Americans after the Civil War. Erasing history of America is not the intent of taking down or relocating Confederate monuments. There are so many historical museums that exist that could house all aspects of Confederate history. The museum can house many different things in addition to those monuments. They can house the history of other soldiers that no one has heard of and museums could even put more of a spotlight on the slaves that fought in the war. According to the Architecture Digest, there are around 718 Confederate monuments and statues that were standing in 2017 and there are over 100 schools that are named for Robert E. Lee as well as for other Confederate icons. There are many people in the world that have helped with equal rights for all people such as Martin Luther King Jr. with his peaceful protests and Harriet Tubman with her help in the Underground Railroad. Why aren’t they rewarded with more schools and statues in their honor? Confederate monuments, Confederate soldiers and anything related to the Confederacy is history, yes. But we should remember which history they are representing. It’s not the side of equality. Granted, there are Union monuments and statues located in the South such as the Vicksburg statue that is pretty much a memorial to African-American soldiers of the Civil War. These are admirable statues because it shows that even as a slave, they had to fight for the South even though the South was fighting for slavery. Parading Confederate monuments around sends this message: The United States is proud that the country was built on the backs of slaves. If our country doesn’t want to send that message, then the monuments need to come down. Editor’s Note: The Department of Communication Studies at Tarleton State University is hosting its third Texan Debate on Thursday, April 12 over the topic of Confederate monuments. There will be three debates in the O.A. Grant lecture halls at 1 p.m., 2 p.m. and 3 p.m. There will also be one held in the Fine Arts Auditorium at 7 p.m. as well.